With Halloween 3 weeks away I decided to revisted a look I did earlier this year. I took this inspiration from a picture of Kylie Mingoue I found on Google images. 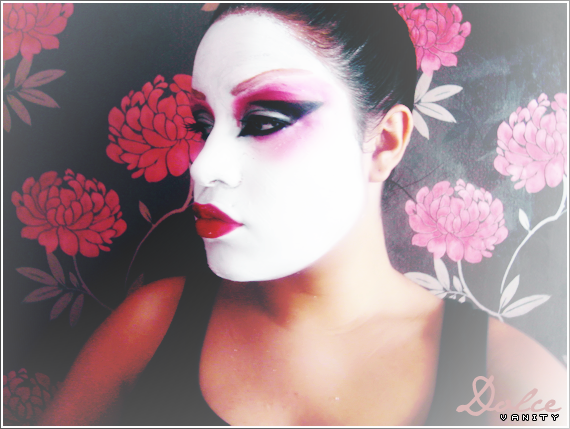 I always find it hard to apply any sort of makeup over face paint as this one doesn't dry 100%. Best results I got was to warm the face paint for it to apply thicker and easier. I had to apply the eye makeup before doing the face paint. I concealed my eyebrows using eyebrow wax and used an eyebrow stencil to shape & fill them in. Don't forget you can like & talk to me on the Dolce Vanity Facebook page. that's incredibly cool! so intricate. Is that what you are going as for halloween? .. amazing look , I really like it ..
..also , you have amazing header - I just fall in love with it , it's so intense ..
my gorgeous love I feel like we haven't chatted in forever... how are you love???!? WOW you nailed this look. I LOVE it. Go girl!